Maleficent. What can I say? As you likely know (because everyone is raving about it), the styling of the movie was impeccable. The medieval glamour was fabulous. You can’t help but stare in awe at the beautiful settings. Medieval glam is an upcoming trend that I’m in love with. The animation on the other hand was hideous. I have absolutely no clue why the animator chose to be so disgusting. Even the “pretty” characters where gross. Maleficent’s new backstory was punctured with sorrow and hatred, which I loved. It gave her character a new soft side. Angelina Jolie’s performance was fabulous. Her cold stare can churn your stomach. Elle Fanning did a fine job, Aurora was love able enough. And the character of King Stefan (Stefan Copley)? Much darker than you might have imagined, his paranoid mind was fascinating to watch. Copley does a wonderful job. The fairies raising Aurora were so horribly annoying that they could have been cut from the movie entirely. What KILLED me about this adaptation was Maleficent losing her power. I love when she turns into a dragon in the 1959 film, here they gave that transformation to her man servant. Maleficent learns that hate is not her path and that to me is just so predictable. Do you think Maleficent deserved to be stripped of her title as villainess? Overall, it’s worthwhile to see a new spin on the old tale, especially when it is as beautifully done as this. P.S. 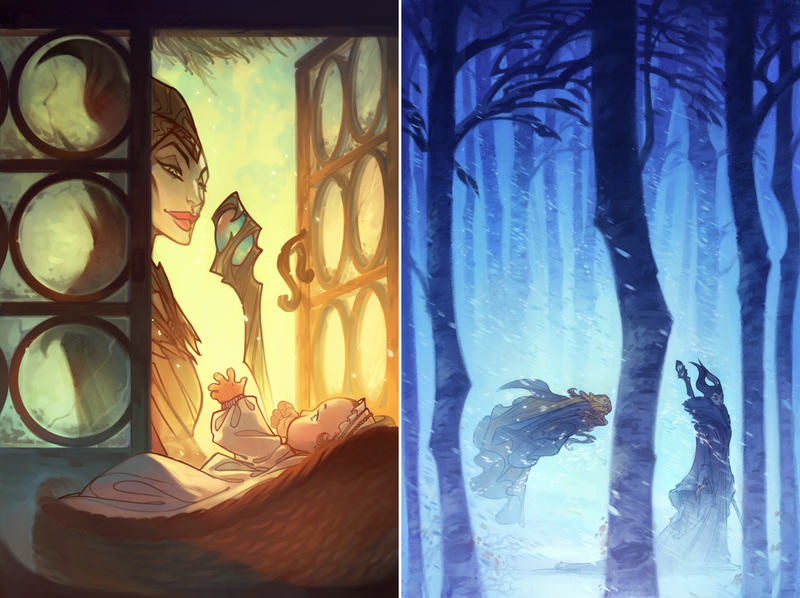 Have you seen this beautiful Maleficent artwork by Nicholas Kole? This entry was posted in Disney Film and tagged Angelina Jolie, Aurora, Disney, DIsney Film, Disney Princess, Disney Princesses, Disney Villain, Disney Villains, Elle Fanning, Film, Film Review, Maleficent, Princess, Sleeping Beauty, Villain. Bookmark the permalink. I haven’t seen it yet, but not looking forward to. Yeah, it’s only really worthwhile to shake your head.